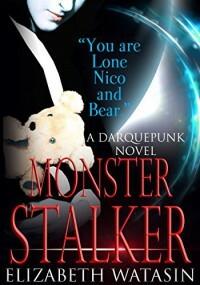 #Amwriting the next Darquepunk book, Bloody Nike, plus addressing final notes on Monster Stalker. I don’t think I ever got around to sharing *why* I’m ‘suddenly’ writing queer science fiction—with a noir and paranormal bent—and have hurtled myself through space/time from the paranormal Victorian period I was immersed in. Back in March, *right* when Wondercon happened, I had a big lightning strike. I have no idea where it came from, but a sci-fi concept I’d been sitting on for years (probably since ’98), suddenly came together. Well, it made sense to me. A planet called Darqueworld with preternatural beings and celestials and leviathans finally *worked*, right then (again, it made sense in my head). And I could have a vampire girl from the ’90’s drop right into it, with her switchblade and teddy bear. IT BECAME NECESSARY TO WRITE IT. The idea of sitting on the idea more whilst I try to get the third Dark Victorian, the third DV penny dread, and the third Elle Black done was kind of painful (PS, my poor POISON GARDEN has hit a big snag due to my needing a new editor. I just need to find a editor with strong Victorian and UK understanding to tackle it. :-/). http://a-girlstudio.com/wp-content/uploads/2015/08/bullet-piercing.jpg 720 971 ewat http://a-girlstudio.com/wp-content/uploads/2015/03/Header_risen-300x169.jpg ewat2015-08-03 20:42:562015-08-03 20:42:56"Nico was a bullet, piercing matter."